You are here to enjoy, we take care of the rest. 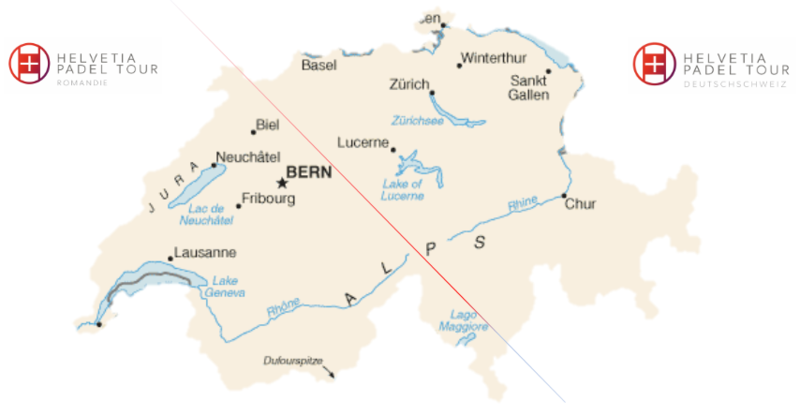 Due to the geographical separation, we will have two parallel regions with two different Rankings: the first in the German part of Switzerland (HPTD) with headquarters in Zurich and the second in the French part (HPTR) with headquarters in Geneva. 2. Make the registration in the tournament of your league. It is the simplest competition and the best way to bring a new Padel club on the circuit. It is a competition within reach of all those clubs that are growing and have lofty expectations for the future. It is the most prestigious tournament. It will take place in the most renowned club from the region. An event that brings the two circuits together. We will enjoy great games before the Master Final. The Padel event for excellence. The four best partners of each league compete for the “Wild Card” (access to the World Padel Tour). It is an event created to the delight of all Padel fans and to promote this sport by attracting new players. Games with the most important players of the international scene are organised. Players from all categories will receive a certain number of points for participating in the group stage, quarter-final, semi-final or the final. Better position, more points. It is an indispensable condition to score, that the player is in possession of the HPT’s annual license. Players without a license will only keep the points obtained in the last 3 tournaments in which they have participated. 3. Fight to get to the top. HPT presents a linear Ranking, which will favour the competitiveness among the players. 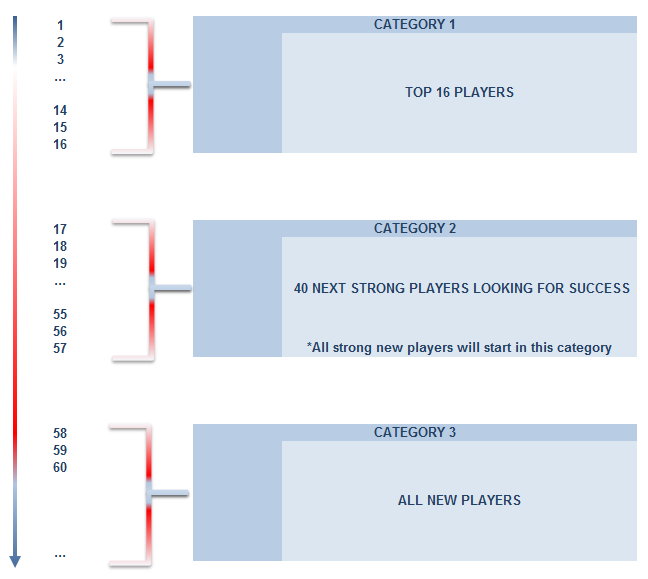 All players will be integrated in 3 categories, but throughout the season and depending on the points obtained in the different competitions, players may go up or down positions depending on the points they add up, being able of moving from category. Experienced players who come new to the competition will start in the second category. The matches will be determined by drawing lots. All matches will be played to the best of 3 Sets (official match). Thus, the winning pair in Group A will play against the winning pair in Group B (1st Semi-finals). 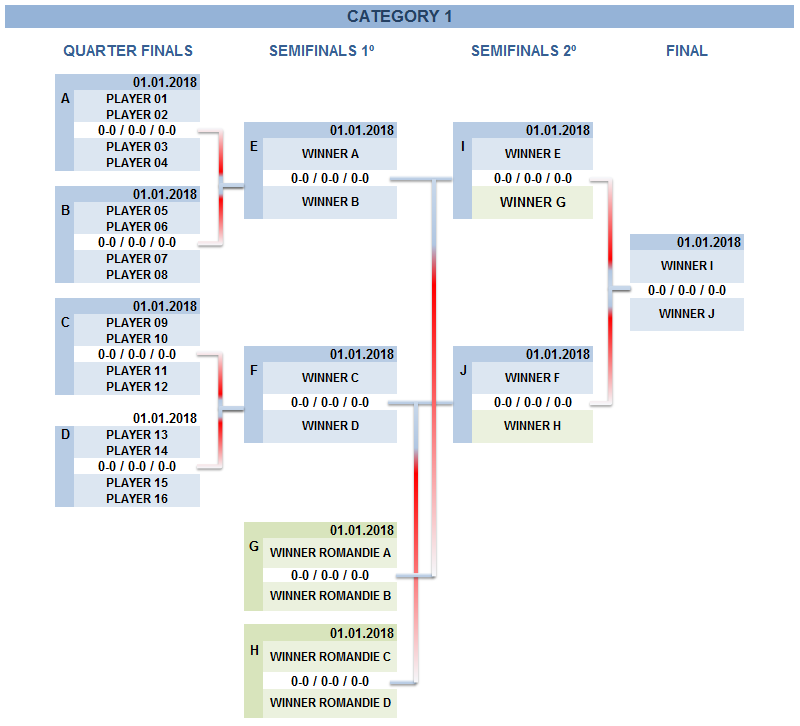 Same goes for groups C and D.
As the previous week will have taken place the same competition in the French part, in the 2nd Semi-final will cross the winning pair of Group E, against the winning couple of Group G (Romandie). And the winning couple of Group F will face in the second Semi-final against the winning couple of Group H (Romandie). The final will be played by the winners of Group I against the winners of Group J, and it will be decided who is the winner of the competition in Category 1. In Category 2, there will be a group stage so that each pair will play 4 games minimum. 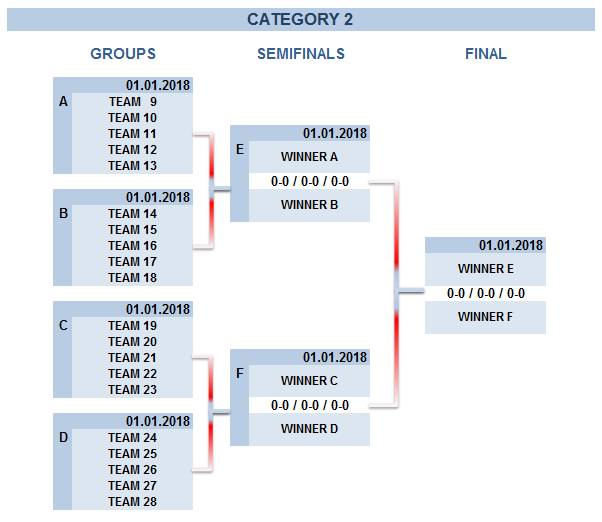 The best pair in each group will advance to the next round, namely to the semi-finals, where the first pair in group A will face Group B, on the one hand. And the best pair in Group C will play against the best pair in Group D, on the other hand. The finalists will be drawn from these matches, so that the Group E champions will play against the Group F champions and will be decide who is the winner of the Category 2 competition. “Blitz” matches will be played, consisting of a set of 9 games. The semi-final and final will be played to the best of 3 Sets. In Category 3, there will be a group stage so that each pair will play 4 games minimum. The two best couples in each group will move to quarters. So, the winning pair in Group A is up against the second qualified couple in Group B. And the best couple in Group B will face the second classified couple in Group A. 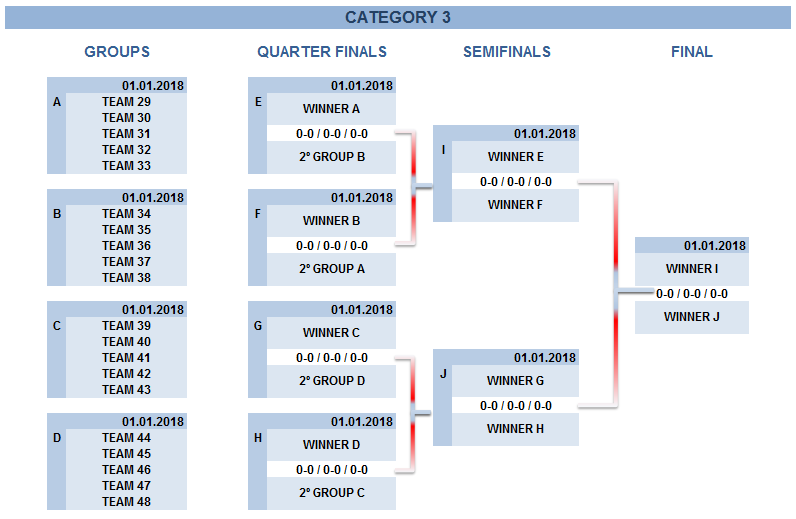 The same will happen in Groups C and D. That is, the first pair in group C will play against the second pair in Group D and the first couple in Group D will face the second pair in Group C.
The semi-final will be played by the winners of the previous crosses, namely the winner of the E and F Groups, and the winner of the G and H Groups, respectively. From these matches, the pairs will leave the matches that will arrive to the final, where it will be decided who is the champion of the competition in Category 3. Matches will take 30 minutes. After this time, the winning couple will be the winner of the match. The final will be played to the best of 3 Sets. You are here to enjoy, let us take care of the rest.